EDINBURG, TEXAS – Most people find it difficult to adjust to change. 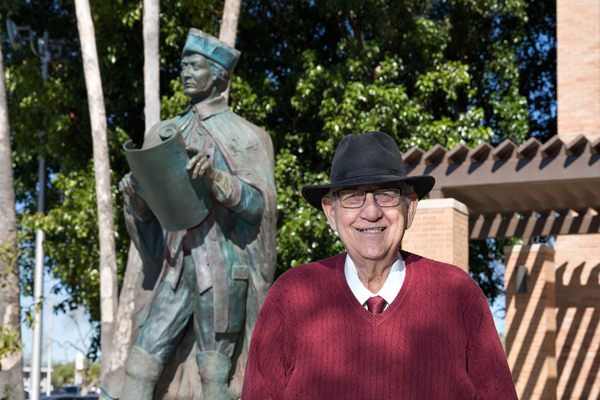 But not Dr. Lino Garcia Jr., Ph.D.
As his 84th birthday looms, the Professor Emeritus of Spanish Literature at The University of Texas Rio Grande Valley says the essence of change still keeps him motivated. Garcia has ridden waves of major change in the Rio Grande Valley’s higher education offerings, going back to his college days in the 1960s at Pan American College, to now – to UTRGV and a sprawling distributed-campus university that serves some 28,000 students throughout the Valley and beyond. He started working at Pan American College in 1967 as a Spanish instructor. Fifty years later, he is still teaching. Throughout the years, Garcia has taught courses in Golden Age Spanish Literature, Poetry and Drama, Medieval Spanish Literature, and Mexican Literature. He has written countless articles on Colonial Spain and its influence on Texas, and on the impact of Spanish-American literature. He also has spoken at multiple conferences and symposiums around the world, something he continues to this day. Education wasn’t always his professional track, though. After his service in the U.S. Navy ended in 1956, Garcia began to pursue a law degree. Garcia popped into nearby Peacock Military Academy in San Antonio to see if there were any options for immediate employment. With his educational background in history, economics and Spanish, Garcia figured he could find something quickly to sustain his family. “They asked if I had experience in teaching Spanish – which I did – so I became a Spanish instructor,” he said. As he talked about his childhood – Garcia was born in 1934 in Brownsville – a patchwork of memories came rushing in. His father worked in a grocery store all his life, and his mother was a stay-at-home mom. They had eight children, Garcia said, and each one of them got a good education – and always had decent shoes to wear. He always had a studious mind, he said, and that meant he was the target of occasional bullying. They lived in a happy neighborhood, he said, and his family would dress up for Charro Days, the annual pre-Lenten festival that to this day celebrates the symbiosis between the border cities of Brownsville, Texas, and Matamoros, Mexico. He grew up watching movies on the weekends. Five cents a ticket. The old westerns were his favorite, and they helped foster his short-lived interest in a law degree. Pursuing a future as a professor of Spanish literature, Garcia obtained a Bachelor of Arts from St. Mary’s University in San Antonio, and a Master of Arts from the University of North Texas. His Ph.D. is from Tulane University in New Orleans. Garcia married his longtime sweetheart, Amalia, on Sept. 7, 1957, at Immaculate Conception Cathedral in Brownsville. They have been married for 61 years and have raised a daughter and a son together. They also enjoy spending quality time with their four granddaughters and a grandson. As social and political environments change, Garcia said, it’s best to adjust your perspectives on life, as need be. Cultural diversity was not as prevalent and accepted as it is now, he said, especially considering most of the staff at Pan American College grew up in the early 1900s. So he tried to help build bridges of communication between the student body, faculty and staff, and tapped into connections he made while lecturing in Spain and Monterrey to facilitate relationships with Valley professors. In 1970, for his efforts to increase student and faculty inclusion, Garcia was named Associate Dean of Men. By 1972, he had helped establish the High School Equivalency (HEP) program at the university. He also was part of the push to revoke the “C or Better” rule, which prevented many students from having access to financial aid. “I’m very proud of my efforts in that, because the university saw a rise in student enrollment once it was eliminated,” Garcia said. Other programs Garcia helped implement are Proyecto Esperanza, which helps students obtain counseling and tutoring, and Upward Bound, which helps motivate prospective students to enroll in UTRGV. From day one, Garcia was on board for the transition of legacy institution UT Pan American into UTRGV. He embraced the Vaquero, the new school mascot, saying vaqueros are a strong part of the Valley’s culture and heritage. Throughout his time as a professor, Garcia helped change the lives of countless students. He always had an open door policy, and if there was any way he could make the lives of his students a little easier, he said, he had to try. Lesly McDonald, a former student of Garcia’s in 1987, said he was “an incredible mentor,” and that his passion for culture and literature was apparent in all his classes. McDonald recounted a memory of Garcia from when she was pursuing her master’s degree in Spanish. During Garcia’s university tenure, he has published multiple scholarly papers and books on various topics surrounding early Hispanic culture. Most recently, he has been working on books of poetry, and continues to collaborate with students and colleagues. As far as the growth of the university, Garcia envisions wonderful things to come. With the increase in new programs, buildings and departments being established at UTRGV across its distributed campuses, Garcia sees a positive, exciting future for Vaqueros and their families throughout South Texas. Written by: admin on April 20, 2018.